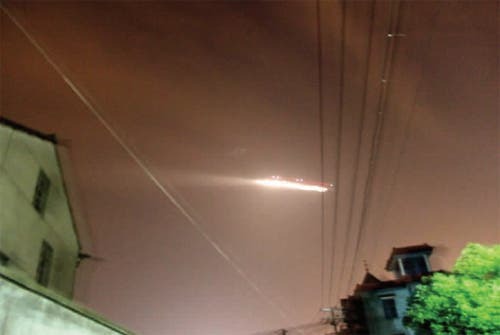 The images of the UFOs have caused quite a stir in China and on blogs around the world are fake according to Geoffrey Forden, an MIT weapons analyst. The first sighting occurred at Hangzhou's Xiaoshan Airport, in the eastern part of the country, according to the state-controlled Xinhua news agency. Eighteen flights were delayed or rerouted and operations shut down after twinkling lights were spotted above the terminal around 9 p.m. July 7, the agency said. According to Xinhua, speculation has centered on a private aircraft. The state-run China Daily quoted a source saying the object had a military connection. Meanwhile, The Shanghai Daily reported a UFO appeared above the city of Chongqing a day later. But many of the images appear to be faked with the software program Photoshop and the ones that were not faked seem to depict the launch of a Chinese ballistic missile, said Forden, who also specializes in Russian and Chinese space systems, published his analysis on a blog called "Arms Control Wonk." "It seems to me that a DF-21 (missile) launch somewhere near Jiuquan and aimed at a point somewhere in the eastern Gobi desert is the most likely cause of this 'UFO'", Forden wrote. Something doesn't sync up here.